which fabric for this pattern? Thread: which fabric for this pattern? I much prefer civil war for this. It will look better with civil war fabrics, unboubtedly. Go with your first instinct. I agree. With all those greys and blues, and the historic "feel" of the quilt, I'd easily do it in Civil War reproduction material. Chiming in to say I agree with the others - I think it would work well in Civil War fabrics. That's a beautiful quilt pattern. I agree with all the others....I think the Civil War fabrics should be used for this one. You'll have to show us the finished product. anything would work with this pattern. Civil war fabrics definitely!! May I ask the name of the pattern? Civil War fabrics would be good. If I were making it, I would probably use Moda Bound to the Prairie fabrics because it would give it a more country feel and I love those fabrics!! I think civil war fabrics would be great to use. ohh, those are very pretty! Civil war; however, I could see it in batiks, 1930's, brights, kiddie fabs. Yes, Civil War fabrics would be PERFECT. It seems to be asking for Civil War Fabrics. It looks like a very nice pattern and will make up beautifully. Show us when it is done. Absolutely Civil War fabrics! Show us what you come up with. Thanks for telling us where we could purchase the pattern. I just bought it. I have a huge collection of Civil War fabric and want to make this pattern. I'm so glad you posted this. I think CW fabrics is perfect for this pattern. Homespuns would work well also. So would almost anything else. Cute pattern!!! Thanks for the idea!! Go with your first instinct - that is usually one that works well. I think it would look great in civil war fabric. 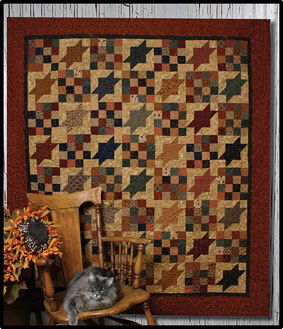 My kind of quilt- it's gorgeous! Thanks for your opinions everyone, and glad some of you enjoy this pattern as much as I do. jcrow, you will undoubtedly finish this before I do, so please share when you do. I am refusing to start anything new until I finish a 5 year old UFO. I am close, lol! I think civil war fabrics would be good for this one. Do whatever you feel will give you the most pleasure as you make it. I definitely like the look with the civil war fabrics - but also can be surprising at how well it would look in other fabrics. I would go with what colors, patterns you would like. Love the pattern. Civil War fabrics would definitely do it justice. I am not an enthusiast of "old timey" fabrics, I'm more of the bright, loud, bold colors, but this pattern cries out for Civil War or "country" fabrics. Go with your first instinct as others have said here. Good luck with your choice! Can't wait to see the finished quilt. This screams for Civil War fabrics! Go for it and have fun doing it!